Xiaomi's Mi Pad 2 has its fair share of devout fans, thanks to its aggressive price-tag (about $200 for the 64 GB model) and rather powerful hardware – a 2.2 GHz quad-core Intel Atom CPU and 2 GB of RAM. Indeed, it's the perfect plaything for the gadget lover and devout Android fan, but there may be yet another Xiaomi-themed toy, and a much cheaper one, too, on the way. 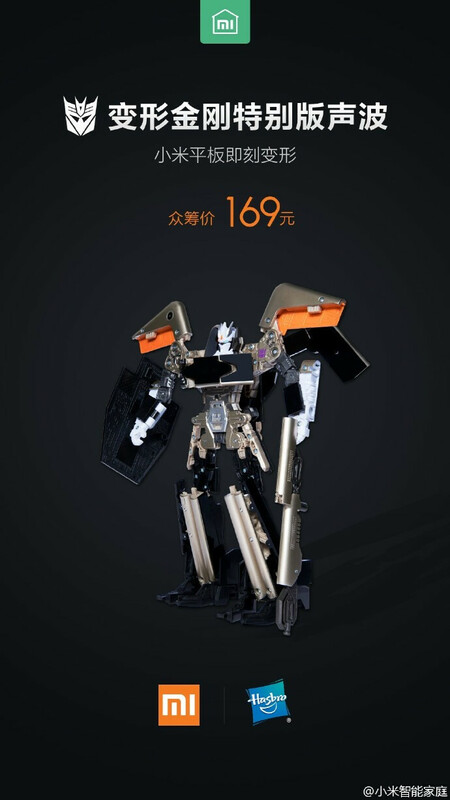 The company has announced a partnership with Hasbro to build a Transformer action figure, which can fold itself into a Xiaomi Mi Pad tablet! Of course, it's not a functional tablet, but it does look rather convincing, especially when viewed from the back. The toy is allegedly planned as a celebration for Xiaomi's 6th birthday, yet reports say it's still going to be a crowd-funded product — maybe it's just “pre-order” lost in translation? In any case, it is said that customers will be able to put money down for their own Mi Pad Decepticon starting April 6th, each unit costing about $20, and shipments would begin on May the 13th. Could this be an April fool's that just now reaches our ears? Probably not — we'd wager that if it was, more care would've been put into making the Transformer Mi Pad look like an actual, functioning tablet. However, we have little hope for the toy reaching Western markets – at least through official channels. 3rd party resellers, however, may stock a few units. Didn't they announce the MiPad2 last year so why is it leaking when we saw it. Aw, lost touch with reality for a while there. Sorry, what year is it? Fixed now, thanks! "Of course, it's not a functional tablet, but it dies look rather convincing" It dies look rather...? Between the misspellings and incorrect date, did you guys proofread this piece before you published it?